Click here to see it. Use the comments section herein to discuss it. Proves that the American Public are basically, idiots…. It certainly is pervasive; I roomed with bodybuilders in college, and I had teammates that juiced. I remember watching wresting with the guys (and I remember the steroids scandal), people like Luger, Hogan and Ultimate Warrior were huge; heavily juiced I’d imagine. Superstar Billy Graham before them. 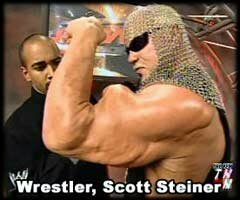 Remember Scott Steiner? Yeah, you’re warned about the evils, but as with everything else, it was always going to happen to “the other guy,” never them.